Interested in making money online, working from anywhere, or having financial freedom? Then let me show you how to start a blog. I could list off 100 reasons why I believe everyone should start a blog. From personal expression, business branding, to making money (some bloggers make some SERIOUS money) EVERYBODY has a reason to start blogging. There are even bloggers (including myself) who rely on our blog for income. Yes, it is possible, and yes you can do it too (you can read how I made my first $1,000 right here). Let me explain how this works. Making the RIGHT blog can make all of that possible. However, wasting your time creating the wrong one (through the wrong platform) can limit all of your potential, including your ability to make money. In fact, I know of bloggers who make over 1-million dollars a year with their blog. Yes, that's right, 1-million (Michelle Schroeder for example). How did they do this? By doing things right the first time. No cheaping out, no wasting time, simply creating something they are proud of and being willing to promote it. The best part? It's quick and painless to start. You don't even have to like writing ( you can translate voice to text, if you prefer that) and you definitely don't need website design skills (lucky for you I can help you with that!). There are a few different routes you can take. However, the most popular (and cheapest to start with) is Wordpress.org. I emphasize ".org." I absolutely do not recommend you start a blog with Wordpress.com or Blogger (or any other free service for that matter). I promise you that it won't work the way you want. Why? Because it will limit your exposure and money-making potential. If you are blogging with Wordpress.com SWITCH NOW. Use my link HERE and for only $3.95 a month, you can set up a beautiful blog with money-making potential and unlimited opportunity. It can be easy (if you follow the right advice) and it's cheap if you choose the right host. I recommend you use Bluehost. It's a popular choice among some of the world's biggest and most successful bloggers. It's cheap, costing only $3.95, it's less than giving up a cup of coffee. They also have a 30-day money back guarantee, in case blogging isn't right for you. I have experience building sites on every platform, therefore I KNOW what works and what doesn't. I currently run two different sites, one on Wordpress.org & Bluehost and one on Squarespace. I will be switching both to Wordpress.org shortly! It's THAT much better (I didn't want to believe it but it's true). Start your blog and stick with me. I will walk you through the entire process. This includes how to start a blog, how to get traffic, and even make money. Keep Reading! Before you start blogging, I recommend you think of some sort of niche. It's OK if you change it, but it's good to have a general idea of what you will write about so you can develop your theme and blog around that topic. The most important aspect is picking the topic you'll be excited to write about. When you are deciding this, think about the subjects you like sharing and teaching people about. Do you love electronics and helping people with their problems? Then maybe a tech niche is right for you. Do you love talking about makeup and sharing your favorite products and tips? Then maybe you are a beauty blogger at heart. As long as they are things you love sharing and educating people on, the rest will come. Even if you DON'T like writing, you can voice record your posts and have them transcripted. There are even free tools on your computer that can help you with this. Could you make a product around this topic someday? Can you refer retail products (Amazon, REI, Best Buy, etc..), books, courses, apps easily? Is there a potential for a big audience? For example, writing about your day to day life could be more difficult to make money from then writing about weight loss techniques. My niche at Nicolestone.com is all about chasing the dream of being an entrepreneur. This primarily includes blogging, marketing, and business related topics. Once you find a niche, you are going to want to find a Host and make money. As I mentioned before, I highly recommend Bluehost. It only costs $2.75 and you can be on your way to making a money making blog in no time! Here is that video (again) that will walk you through it if you don't want to read the directions below. YOU ALSO GET A FREE DOMAIN (aka URL!). On average, a domain can cost you $12, but by using my link you get one free with your service. 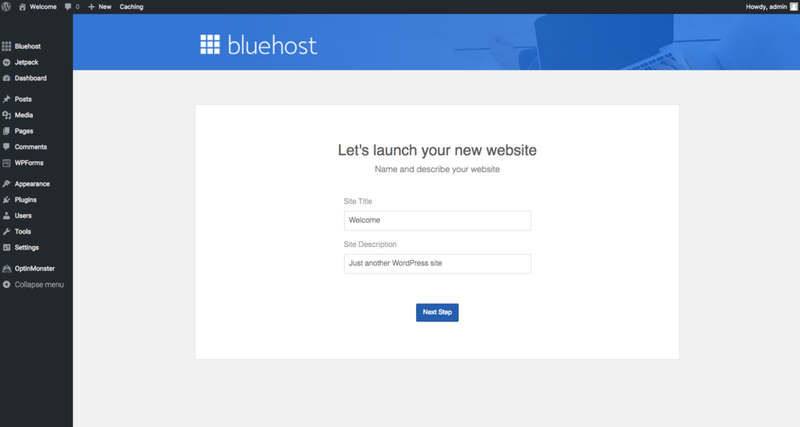 Visit Bluehost.com and click the "get started now" tab as shown in the image below. Select your plan. For most people starting out, the basic plan works just fine. However, if you have really big blogging plans, don't be afraid to sign up for the Plus plan, especially since it's only $3.95 (only 1$ more a month!). Make sure to hit select and move on to purchasing your domain. This is the fun part where you get to setup a domain! Remember that niche I told you to think of? That's where it comes in. Your domain can literally be anything you want. It's also OK to use your name, especially if you aren't positive about your niche yet. It is entirely acceptable to brand yourself. If you've already purchased a domain, you can transfer it over. Purchase your plan! That's right you are almost a business owner. The 36-month plan is the cheapest (the $2.75) and if you are at all serious about blogging and making money, then just do it! Otherwise, there is a 12-month plan you can switch to. Don't forget, you do get a money back guarantee. Remember the domain is worth up to $20 itself, and you get that for FREE. Enter your payment information and get ready to launch your blog. Remember, online payments are SECURE. The way of the world is now online purchases, so know that when you purchase through Bluehost, your product is completely secure. To finalize your hosting package, Bluehost will want you to pick a password. This is to make sure your dashboard stays secure. Pick a unique password that will protect your privacy and your site. Security will matter, I promise. Nobody wants to build a blogging empire to simply find out it was hacked. Remember to write it down or keep a record of it, you will need to use it frequently. This is also how Bluehost will confirm your identity when you contact their support team. Next up is the fun part, where you get to install WordPress and design your site! To start, Bluehost will want you to pick a theme. You can use a free theme and do your best with it, or you can purchase a premium one. It's entirely up to you. Either way, remember the "theme" is the appearance of your website and what your visitors will see. Purchasing a premium theme can be a good idea. I bought my theme from Station Seven. They create unique, minimalist themes. If you want, they will even install it and set up the demo for you. This speeds up the process and guarantees a beautiful website. Best of all, their themes are ridiculously affordable! You can get a Station Seven theme by visiting their site here. You can purchase their themes HERE. If you want something really eye catching (and have the budget to afford it, then I highly recommend you bite the bullet and buy it now. They can't set it up for you once you already have content). Below is an image of FREE themes that you get with your Bluehost/Wordpress account. Then hit the "Start Building" button below. Then you will be given the choice between Business, Personal or not needing any help at all. There isn't a wrong answer, it's whatever you are comfortable with! Welcome to your Bluehost dashboard! Bluehost is there to help you create your first posts. Just follow along on their dashboard. Yay! You have your very own blog! As shown in the images above, Bluehost will walk you through how to create content, add images, etc. One more reason why you want to use them as your hosting provider. Michelle Schroeder has an awesome course where she teaches you how she made 50,000$ a month from affiliate marketing. Make sure to check out her course here. A cheaper option is Master Affiliate Marketing which you can learn about here. READ PART 2 (JUST ADDED): HOW TO MAKE MONEY WITH YOUR BLOG! Starting a blog is so much easier then most people think. Bluehost makes it so easy for anyone to start one, at an incredibly affordable price. FREE & CHEAP BLOGGING COURSES THAT WILL SKY-ROCKET YOUR PAGEVIEWS - Learn from these, without breaking the bank. THE ULTIMATE GUIDE TO GAINING INSTAGRAM FOLLOWERS - The exact strategy that gained me 13,000 followers for my @nicolestoneoutdoors account. If you found this post useful, be sure to reach out to me and share on Pinterest.